Robert Standish’s Singapore Kate should have been titled Shanghai Kate. For much of the “action” takes place in Old Shanghai. Robert Standish aka Stephen Lister, both pseudonyms for writer Digby George Gerahty (1898 – 6 November 1981) introduces us to the exquisitely beautiful English girl, Kate Marlowe in Old Shanghai. The Publisher’s note mentions how Kate Marlowe, an innocent young girl from Sussex faces a fighting battle against predators which as we find out later in the book include pimps, a brothel madam and always in pursuit wealthy Shanghai suitor keen on making her his mistress. Robert Standish mentions he first met Kate Marlowe in Jessfield Park (Zhongshan park) in 1920 (though the book is published in 1919 or 1964…needs checking?) in Shanghai & was immediately smitten by her beauty. He later met her in Provencal, then Switzerland and after her death he inherited her Memory Box that could only be opened by pressing the tiger’s tail & putting a hand on the sage’s head. Much of what Standish wrote is based on the contents & clippings from Kate’s memory box. The plot is fairly straightforward: Kate Wilder/Ferrari/Marlowe, leaves her unfaithful husband, Colin Wilder, is later (1903) employed by a dubious Madame Rosalie/Rosalie Jenkins selling high-fashion evening gowns from Paris & London to the westerners at Raffles Hotel, Singapore. The copper-haired beauty with blue-gray eyes attracts the attention of one John Ingleby of Ingleby & Waters, an old and established firm in Shanghai. The married John Ingleby tries his best to win her over, plots with Rosalie but finds Kate unimpressed. Instead, the engaging charms of the swashbuckling Gordon Maitland, a broker from Shanghai appeal to her much more. Rosalie & Kate arrive in Shanghai from Hong Kong, ensconced in Kalee Hotel funded by mastermind Ingleby but unbeknownst to Kate. Kate and Gordon first meet at the lobby of Kalee Hotel where he jocularly calls her ‘Singapore Kate’ based on her luggage tag only having the label “Singapore.” But, Kate & Gordon’s early courtship comes to a twisted end with Ingleby sending Maitland to Hankow on a work errand. The ploy does not work and Kate finds out the truth & a distressed and alcoholic Madame Rosalie is soon found dead in Huangpu river. For failing Ingleby presumably…. Strapped for funds, Kate then moves to Broadway Hotel in HongKew (HongKou) run by Konstantin Pavelitch. Thereon, well-laid traps preying on Kate’s dwindling fortunes and innocence, the journey from prostitution to a madame of a brothel is marked with characters including Ingleby who died in her bed (not for the reason you are thinking of…tsk, tsk! ), mountainous woman Belle Darling, Toni Simonides, a violent Greek cafe proprietor, Mary Simonides, a Cockney ex-dancer married to Toni, Edith Ingleby, all play a role in changing rather tarnishing Kate’s life forever. The characters are so real, straight out of Old Shanghai’s badlands. The author’s note is what makes the story so very real. I am reading another book though non-fiction on Shanghai prostitution and few characters described in this book & Singapore Kate bear quite a similarity. The timeline however needs checking. So, was Kate a real person? Well, yes. Who was she? Was she Emily Moore? Who was Ingleby? There’s a brief mention of an Inspector from Shanghai Municipal Police who helps Kate successfully execute her revenge against those who pushed her into prostitution (a little too dramatic and seems contrived). In the end, Kate leaves Shanghai forever auctioning her house (a brothel near Soochow/Suzhou creek) and its contents including 250 evening gowns, a magnificently carved ivory four-poster bed, linens, curtains and carpets…. “In every whore, Kate believed, there was a real need for respectability.” She left Shanghai as quietly as she had come. That need for anonymity and respectability was possible only after Kate made her money through prostitution. While I felt huge amount of sympathy for Kate, the story harped many a times on her jaw-dropping beauty that seemed to strike men of all kinds.Could she not have taken up a teaching job or become an actress? As Kate points out that she could not become a governess because women mistrusted her and jobs for white women were very few. Plus, once she was in Belle’s brothel, it was not possible to come out with her reputation unscathed. The Shanghai Municipal Police (SMP) consisted of the British plus foreigners including British Sikhs, Russians, Americans, etc. One wonders on how they got along. Imagine a conversation between a Sardar, a Brit, a Russian & an American …. the colorful language, lot of gesticulation, the name calling that may have transpired … not to forget the lost in translation jokes and issues….or perhaps the communication was very much formal & stiff considering the police was after all British, their dry humor notwithstanding. Only the Brits & Americans spoke English, making for smoother interactions one thinks. 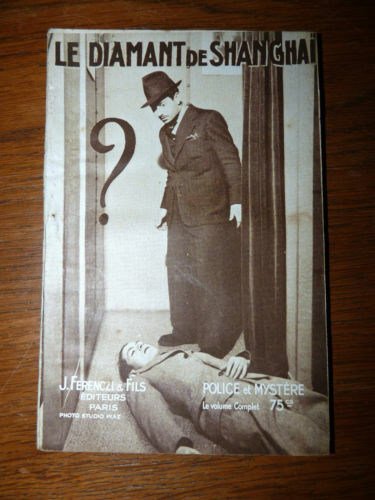 The presumed camaraderie between the English speaking British and American cops goes for a toss though when you read E Crabtree’s account in The Blue Book magazine. Smith, was a newly promoted sub-inspector who dredged Crabtree up in front of the SMP Commissioner for breaking regulations: once for smoking on duty, second for being shoddily dressed for a parade as a button on his tunic was undone and third for being disrespectful.” Smith tried to make Crabtree’s tours of duty as “miserable as possible” perhaps because he was the only American guy on that team, a reason that Crabtree conjectured. Crabtree’s third offense meant transfer to the Reserve Unit/Riot Squad duty at the Gordon Road Depot. But, Crabtree soon got his sweet revenge though unintentionally…. Crabtree takes us through a thrilling and a dangerous police chase that was really a ho-hum affair in Old Shanghai. Chasing a Chinese kidnapper, shooting with Thompson guns, throwing over a hand-grenade that turned out to be a dud, riddling the roof from down below with bullets to injure the kidnapper…all elements that make for one helluva cops and robbers or in this case kidnappers story. Red Maria (the armored truck), Inspector Fairbairn, P.C. Menzies and few others are mentioned. So how did Crabtree get his revenge… albeit, unintentionally? Well, Smith wanted to look like a hero & rushed in a zone (where the Chinese kidnapper was hiding) that Fairbairn had prohibited anyone from entering. Crabtree seeing a shadow shot immediately as were his orders. The bullet went through Smith’s knee keeping him out of commission for two months and he ended up with a slight limp. 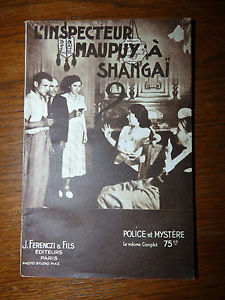 A bloody revenge …actually quite tame if you consider the hair-raising and bizarre police chronicles in Old Shanghai. Smith was a fake name. The account seems authentic. E. Crabtree exists on the Shanghai Municipal Police roster compiled by Professor Robert Bickers and the time period seems to be correct. Source: The Blue Book Magazine, September 1932, archive.org. After my return to Philadelphia from Shanghai in 2012, I spoke to my very dear Parsi friend, Khorshed, of my interest on researching Sikhs and other Indians in Shanghai, Tianjin & Hankou. I also apprised her of Shanghai’s Fire temple and its unfortunate demolition. To my surprise, Khorshed, mentioned that her father had been to China and had worked in Tianjin. Khorshed’s father, Ratanshaw B Vakil, had been employed as a manager in the Talati House Hotel in Tientsin in 1948. He did not stay in Tianjin for very long & headed to greener pastures in Singapore soon after. Today, at the National Archives, Singapore I had the opportunity to hear an audio-recording of his experiences in Tianjin. After this incident, Vakil decided to pack his bags and leave. 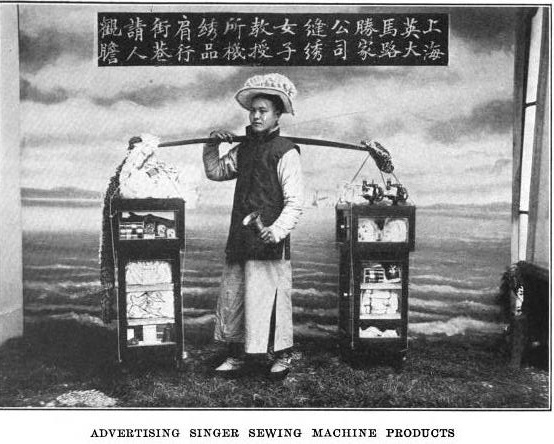 He sailed to Shanghai and from there took a flight to Hong Kong and then Singapore taking up employment in a firm. Vakil, mentioned that there were only 3-4 Parsis in Tianjin unlike Shanghai which had a sizable Parsi community. He stated that Talati, the owner, stayed back in China even after Japanese internment and later died in Tianjin. Audio-recording: Ratanshaw Beghampore Vakil, National Archives, Singapore. In the context of Sikhs in Shanghai, there are few anecdotes and some Oral Histories that make for an interesting version of unreported facts. In the 1980 Susanne Goldfarb (1933-1987) recording on Holocaust survivors by WisconsinHistory.org, her Oral Transcript offers a glimpse of an interracial wedding held in the Sikh gurdwara in Old Shanghai. Susanne was six years old when she moved to Shanghai with her family in 1939 from Austria.The family took refuge in Shanghai fleeing from the Nazis. On being asked on the topic of intermarriages of Jews in Old Shanghai , Susanne spoke of a marriage between an Indian man and a Jewish girl (from a Orthodox Jewish family) in the Sikh gurdwara (presumably the Dong Bao Xing Lu gurdwara as that was the most prominent one) where the parents (Bengshens) of the girl sat in shiveh (seven-day mourning). Sitting in shiveh was a clear expression of the family’s disappointment in her choice of a Non-jewish suitor. 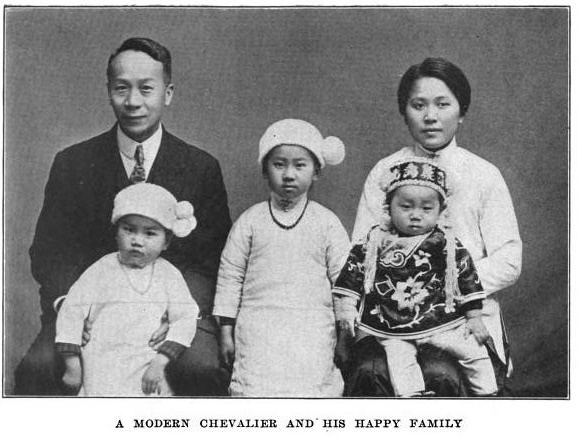 The newly married couple later settled in Hong Kong. 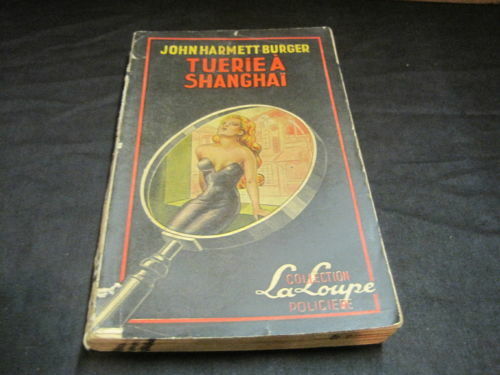 Three Shanghai related mystery/fiction books listed on ebay. 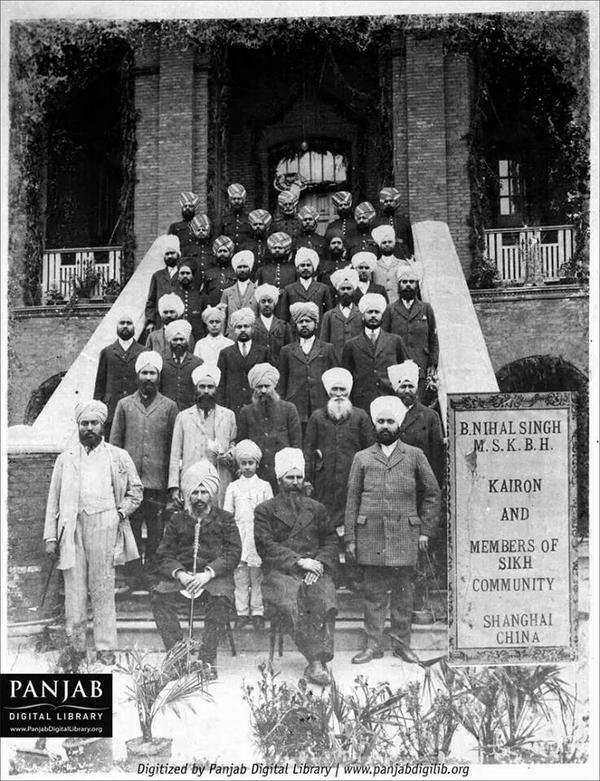 A photograph that strengthens the Shanghai Sikh photo collection besides underlining the significant historical presence of Indians in China. 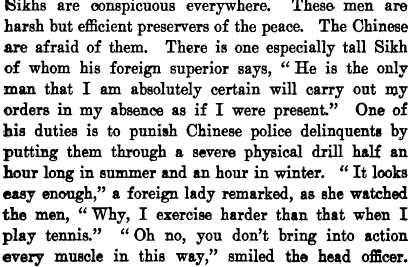 A book published in 1916 becomes a luminous guide to life in China and yes, of course the Sikh policeman in the employ of Shanghai Municipal Police. Several books published by western sojourners have flagellated “the exotic, statuesque, stalwart Sikh in British China.” So, it comes as no surprise when Mary Ninde Gamewell, of the Methodist Episcopal Mission, stays on course with the trite refrain of the tall, dapper looking turbaned Sikh policeman in Shanghai International Settlement. “The picturesque red turbans of the Sikhs are conspicuous everywhere.” (Yes, such a shocker!!) But, sarcasm aside, Gamewell expounds a tad bit more than many of her counterparts , who after the first, cursory look could care less for the “harsh, preserver of peace” that the Chinese so feared. The Chinese as stated in the book preferred punishment at the hands of the British rather than the detested Sikh. (Well, the strategy of “Divide and Rule” was working effectively.) Training was held in a recruiting station but the Sikhs and Chinese had different yard space. Owing to caste rules, Sikhs abhorred any food prepared by the Chinese. What is interesting, of course, is the Gamewell’s presentation of the “lax” Sikh watchman. This was a view shared by the Sikh policemen supervising officer, Captain E.I.M. Barrett who considered the night sentinel to be shabbily attired (those outside the purview of Shanghai Municipal Police) and disrespectful. In Shanghai Municipal Archives (and North China Daily News), there is a tiny report in which Barrett is simply displeased with the disrespectful Sikh watchman. On one occasion the culprit Sikh watchman did not salute Barrett, provoking latter’s ire. While the book has very appealing in-depth aspects with chapters on “Street Rambles” and “Lure of the Shops” and heck of a lot more, it, still, simply presents itself to be the product of its times where stifling hierarchy was utmost. The Sikhs were somewhere in the bottom, naturally, and hence few words here and there on them sufficed. In fairness, the book could not have encapsulated every tidbit on the Sikhs in Shanghai but it does go past the expected norm. 2 days ago, I got an interesting email with photo attachments. The email was sent by Jaskaran Singh Sangha and he had a very enthralling Shanghai Sikh history with family photographs to share. His grandfather, Kartar Singh Sangha served in the Chinese Maritime Customs Service and lived in Shanghai from 1919 to 1961 (way past the revolution) . The photographs are a rich reminder of the Old Shanghai Sikhs. They too led valuable lives and such stories cement the fact that we need to preserve this aspect of Old Shanghai history, lest it be forgotten. Here’s a ca.1936 photograph from Sangha family archives that captures Old Shanghai Indian history in a two pronged fashion. 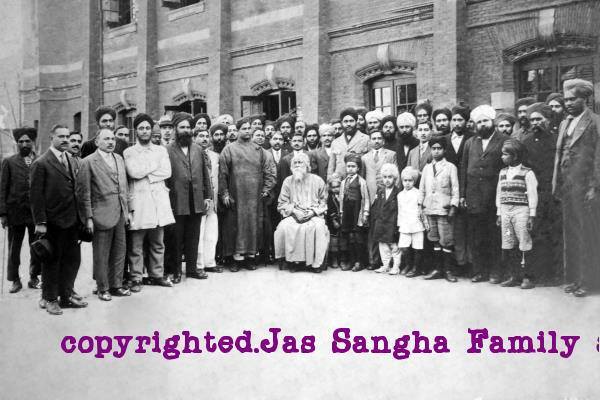 One, there are the Sikhs, the former Shanghai Sikh gurdwara in the background, Jaskaran Singh Sangha’s grandfather , standing tall in the light overcoat and dark turban. Secondly, he is right behind a familiar and famous Indian poet, Rabindranath Tagore. It’s a moment that showcases the rich heritage that has been fast fading.